Houses under construction are invariably wetter than they will be in service. Allow construction dampness—from fresh concrete, wet lumber, plaster and drywall finishing, and drying paint — to dissipate before delivering the wood flooring. HOW long to wait depends on how much moisture was initially put into the building and what is being used to remove it. Wood flooring should be delivered only once the house is at the correct moisture level. Most manufacturers produce flooring with moisture content between 6 and 9%, and they recommend the flooring be maintained in this range for best performance. This coincides with the normal comfort range for humans, 30 to 50% RH at 60 to 80°F. To help maintain this moisture content in the flooring, the average moisture content of the framing members should be below 14% before delivering the flooring. Floor joists, framing bottom plates, and doorways are generally a good place to measure moisture content with a moisture meter. 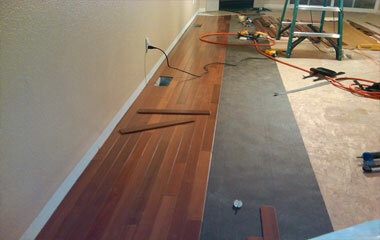 The heating and cooling system should also be running before delivering the wood flooring. This will aid in removing residual construction moisture and help get the interior of the home to its normal expected environmental conditions. You may need to run temporary HVAC equipment such as portable heaters, air conditioners, blowers, and dehumidifiers on-site if the home’s permanent system is not operational. It may take a week or two with the HVAC operating to remove the residual moisture from the building.